With a couple of months left to signing date, can anyone provide any information as to how many will we sign and what players are we involved with. I know there are a lot of rumors floating around and we may surprise some people. The one thing that is mum is the QB recruiting. No one seems to have responded to this post. Does anyone have anything? We have some definite needs - QB, WR, OL (even with our current commits), TE ( to replace two graduating TEs), LB (to replace Zach Harris and for depth), and secondary (to replace Teamer and Lewis). Those are minimums. Who may fill these needs? QB: Keep an eye on Kinkead Dent (MS) and Kaiden Bennett (CA). Dent is more of a pocket passer but has mobility. Bennett is a great athlete. Both have several G5 offers. Of course, we are also trying really hard to pull Lance LeGendre, but I'll file that away under "unlikely" until we hear something more definitive. WR: I think this position is pretty difficult to predict because we've offered so many of them. There are some guys who have been in touch with Tulane through the process and visited campus. I think Kash Foley, Duke Bell and Dajon Richard (recently de-committed from UTSA) are names to watch. We're recruiting a guy named Tifton Dobbs from Alabama who looks intriguing. He's 6'7 and runs better than you'd expect. TE: Neal Johnson is a kid from Mesquite, TX we've been recruiting and has been on campus. He's a good athlete who has played multiple positions in HS. He's a lot like Tyrick James. Our current TE commit, Conner Richardson, looks a bit slow on tape so far. Great size, though at 6'6 240. LB: We have Darius Hodges committed at LB, but he's going to end up playing rush end. Nick Curtis from Hoover, AL could be a name to watch (PJ Hall and KJ Vault's alma mater). Secondary: Tyler Scott is someone we've been after hard and who could commit to a school soon. He'd be a great get at safety. Braxton Ragland is a kid we've recruited hard (former Ole Miss commit). We're going to play Freddie Mango at safety, so he's locked up one spot. Some schools see Dajon Richard as a corner, so he could fit in here too. Just my 2 cents. We might sign a smaller December class than last year and have more slots open for February. Staff always surprises me when it comes time for visits. Anything can happen. TU23, I want to add my thanks. I hope we see some tweets from prospects whom the coaches visit. That would be a good source. Also, if anyone sees such tweets, please include the link on the forum for those of us Neanderthals who do not tweet. +1. I don't comment much on these because I don't have much insight to offer, but I definitely appreciate the info from those who are in the know. No one better than TU23 when it comes to analysis and recruiting. Thank you my friend! Anderson is a current South Alabama commit, but we're really pushing hard for him. Kaiden Bennett committed to Boise State. It looks like we'll need to find someone else. I believe that there are still several pretty good uncommitted QBs out. Hopefully, we can find one. I don’t understand what is going on with our recruiting. I don’t understand it based on last years class. I hope we can finish strong. There is hardly any news and we haven’t had a good year in Louisiana where it is a strong year. We need to pick it up and quickly. TU23, we need an update when you get an opportunity. Thanks! 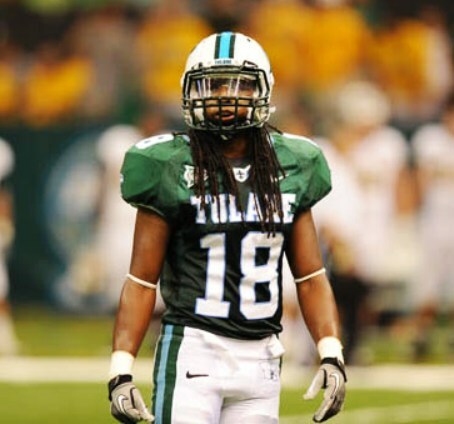 There’s a growing trend that Tulane is benefiting from is P5 transfers. There’s a lot of talent being underutilized, good players that can’t move up the depth chart at P5 schools. McMillan (LSU) and Dauphine (Texas Tech) have been huge in victory. Hopefully, Tulane will continue being a landing spot for good players that aren’t getting PT at a football factory. Next weekend should be a weekend with a number of visitors. Hopefully, we'll have some good ones. Also, hopefully, someone who knows will give us a list of visitors at the end of the week. Certainly the skill players get the pub but I'm hoping for more Fishers and Knightons. A grad lineman with eligibility who might be an NFL free agent might see that a year in a Tulane system which will need immediate help in 2019 and that puts a premium on good OL play might be a way to improve pro potential status. Regardless it's now evident to all that Fritz has the memory of a cornerback in recruiting. If he gives up a TD bomb (like the Scott whiff and the exodus of backup QBs last year), he keeps working the problem and next thing you know Howard and McMillan show up. 24/7/365 grinding may not generate headlines but it can get results. He simply never quits. 24/7/365 grinding may not generate headlines but it can get results. He simply never quits. Still, when all is said and done this season I would love to have a one-on-one with Coach about personnel use and play calling in games 1-6. Like, WTH was your thinking? Staying with Banks too long I kind of get though I disagree. He rewards practice work and McMillan was still getting lost on the way to the Wilson Center. Not using Thunderbolt and Lightfoot instead of Huderson diving for 2 yards every play makes my hair hurt. Of course winning on the road cures many sins, but the play calling and personnel use difference is astounding. I believe that’s the difference in 2-3 more wins right there. The only possible excuse would be if Dauphine was in even significantly shape (either via injury or conditioning) than was reported. Otherwise, there's no reason for Huderson having seen this much playing time. Regarding Dauphine, there were significant conditioning issues at the beginning of the year. He wasn't ready to play against Wake. Against Nicholls, he cramped up and had to get IVs. They gradually increased his workload against UAB, Ohio State and Memphis. He was ready to carry the ball 15 times effectively by the Cincy game. The SMU/Cincy games were the games where I thought he should've gotten the ball more. He had 6 carries for 35 yards against Cincy and 3 carries for 3 yards against SMU. Huderson had 2 carries for 3 yards against Cincy and 6 for 42 against SMU. We abandoned the run too early in the Cincy game. The issue in the SMU game was Jonathan Banks. He carried the ball 18 times (more than anyone else). The QB should carry the ball 10 times max (and that's assuming the QB run is effective). He took carries away from Dauphine/Bradwell/Jones/Huderson with poor reads against SMU. Regardless, Dauphine should get at least 15 carries a game. USF was kind of the perfect scenario...16 for Dauphine, 15 for Bradwell. Enough to get them both going and not too many to wear them down. The Tulsa game was pretty balanced as well...18 for Dauphine and 12 for Bradwell. Regarding a recruiting update, I'm not sure what is going to happen right now. As far as QBs go, Kinkead Dent was at our last home game. Would be interested to see if he's at the next one. We need at least one incoming Frosh QB. We're in the final 4 for Charvis Thornton from Southern Lab. He's a high 3 star player, top 30 in LA. Can play RB or Safety. Other schools are Memphis, Kansas, La Tech. With Kansas' staff getting fired, that's going to hurt them with all of the LA kids (until they determine whether Tony Hull will stay on staff with the next coach). I wouldn't be surprised if we made some headway with Bertrand Carroll, safety from Madison Prep. He looked like a hard Mizzou lean but Mizzou has commitments from at least 3 other safeties. I am frankly surprised we haven't gotten a commitment from another big safety prospect from Florida who we've been after for a while. The staff is high on Marcus Harris, a 6'3 DE from Montgomery, AL who could fit in well behind Cam Sample. I know we want one more tight end. I have a feeling that we'll end up signing some guys who we either 1) don't think we (the fans) have a chance with right now or 2) aren't linked to publicly yet (not under the radar, just that we're not linked to them). Thanks for your posts. Always good insights. Would like to see Tony Hull on our staff. Believe Dauphine was injured during preseason workouts. it's a shame people would talk this way about Dauphine. He was not out of shape. He hadn't played much football in a long time. The main reason the staff didn't play him was they perceived what they thought were weaknesses in his game. Many disagree with their assessment. Glad they have finally seen the light. There's a big difference between being in shape and being in football shape. The coaches sat him out game 1 because he wasn't healthy enough to play. Game 2 he suffered serious cramping from a combination of excitement, heat and not playing football in a while. Nobody is saying he was fat and out of shape, but you said it yourself, he hadn't played much football since high school. It takes time to build up the stamina to play in full pads, run full speed, get hit, pick yourself up and do it over and over. He got more carries each week until the Cincy game. The SMU and Cincy games were completely on the coaches and indefensible.